​​​​​​​​​​ ​DALLAS – Locally based Larkspur Capital is preparing to start construction on a boutique apartment building overlooking one of north Oak Cliff's busiest corners. 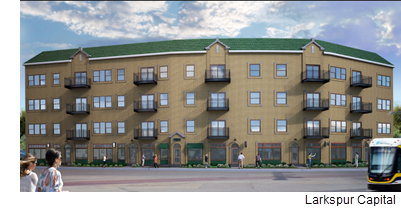 The 41-unit Zang Flats building will be​​ at the corner of Zang Blvd. and Beckley Ave. near Lake Cliff Park. It will replace an old site. ​See also: Dallas-Fort Worth-Arlington Multifamily Market Research​.